​The Gladiator of the canine race, The white cavalier, vark hond, pig-dog or rat-dog. 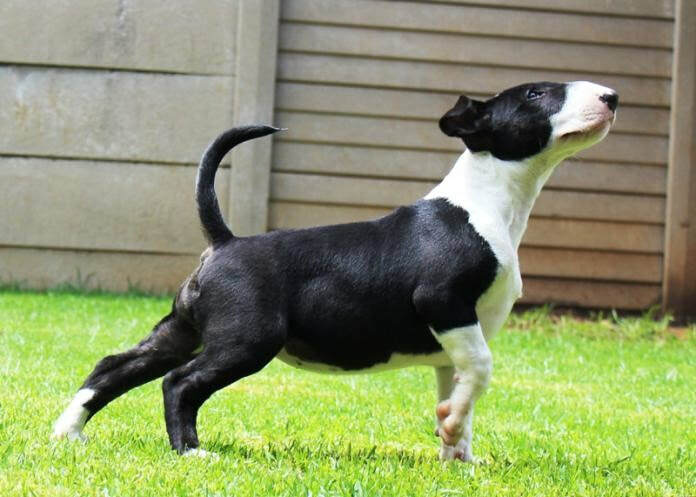 All the names given to this one of a kind breed, The Bull Terrier. The bull terrier is quickly gaining popularity around the world as a wonderful companion breed. 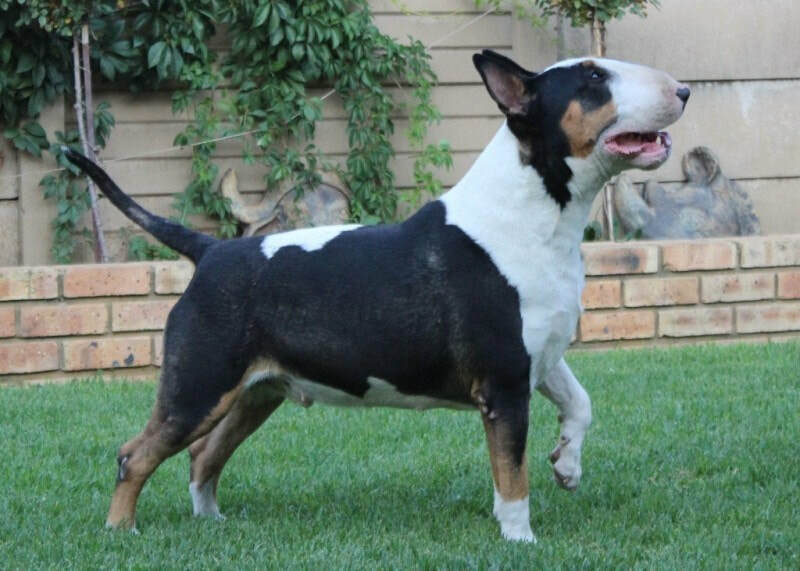 Highly misunderstood, with a reputation of a “fighting” dog, the Bull terrier deserves a review truly worth its recognition! What you are about to read will make any enthusiast heart beam with pride and any “hater” reconsider their opinion of the breed. You are about to meet the REAL bull terrier. So, if you want a friend to share EVERYTHING with, from your bed, your couch and your dinner..here it is! If you had to picture a career for this dog, “circus clown” would be my only choice. Any owner will tell you about the “clownish and quirky” side of a bullie, whose antics will make even the most serious of people giggle. Heaven only knows what goes on in the mind of a Bull terrier! They will quite happily run into tables and doors (like my own bullie did once, completely derailing the sliding door) and continue on their way as if nothing had happened. Your typical “bull in a china shop” So if you own lots of china, this dog may not be for you. 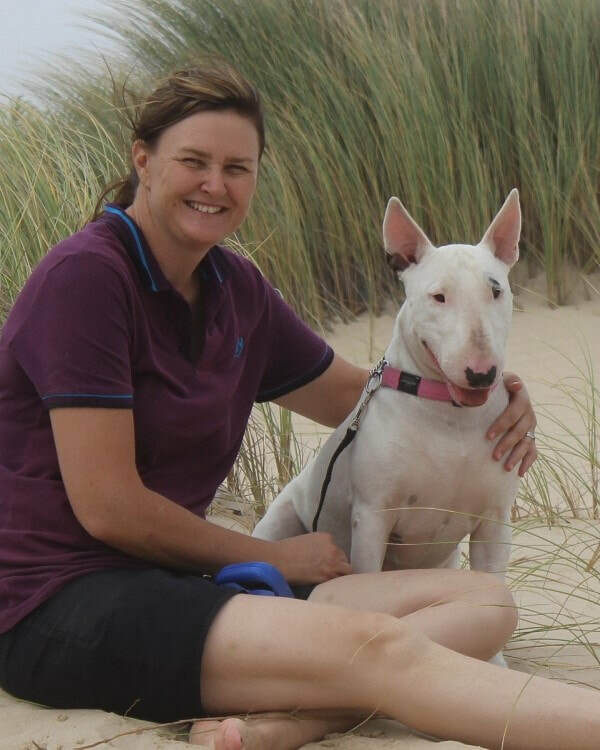 Friendly, clumsy, courageous, with a true love for people and companionship, Bull terriers love nothing more than being part of a family and getting involved in all family activities. They do not do well left alone day after day and will become destructive if left to their own devices. It would be like leaving a creative child alone in a room full of explosives! ​Bull terriers should approach people with confidence and not show any signs of shyness, aggression or fear. They can, however, become over excited when greeting people, so basic obedience is a must! Especially around small children, as such a muscular dog can easily knock over a child, though not intentionally. 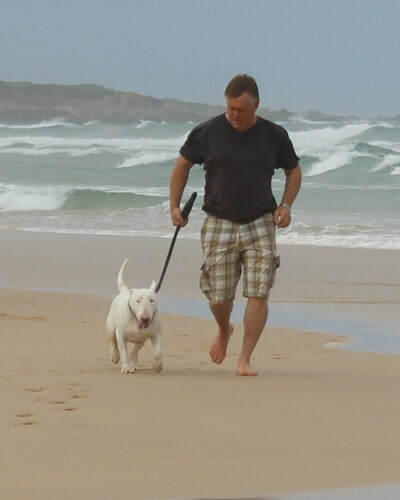 Bull terriers love children and could not ask for a better play mate! Smaller children should always be supervised with such a rowdy, excited breed. Older children are more compatible. 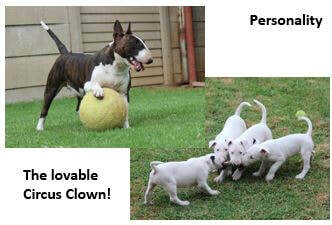 Female bull terriers in particular, can be completely trusted with children. 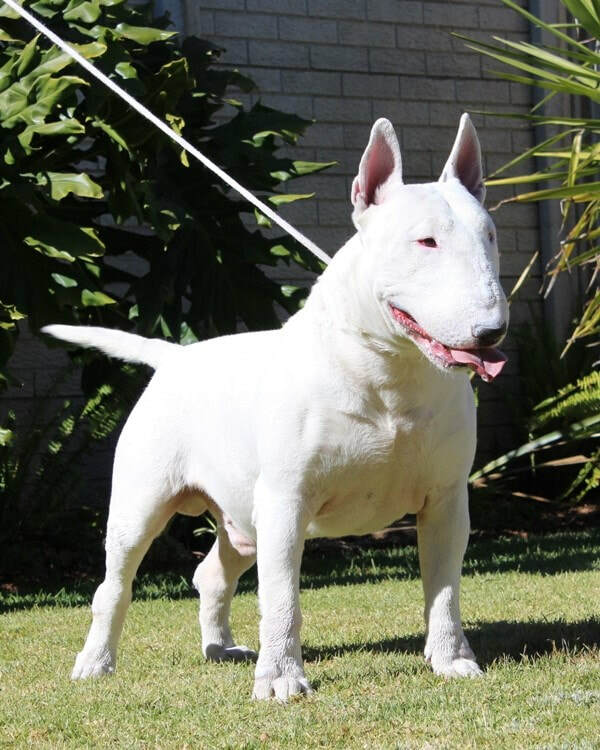 Bull terriers are active breeds and need a good amount of exercise and stimulation. Being “high prey drive” breeds, they LOVE toys, especially human interactive toys, like Frisbee, tug a ropes and swing ball. They are also BIG sun worshippers and given the chance, will lay in the sun and catch a few zzz’s. So sunscreen is particularly important for this breed, especially the white dogs. They do not live well in cold, damp conditions, so if you live in a cold area, a jersey can be worn by your bullie. Bull terriers are also not very big on barking. Is This The Correct Breed for You? If you love being active, work flexible hours and are fit and healthy, then yes, the bull terrier will make a wonderful companion for you! They fit in well with out-going families, preferably with slightly older children, though younger children can be a match if always supervised by an adult. 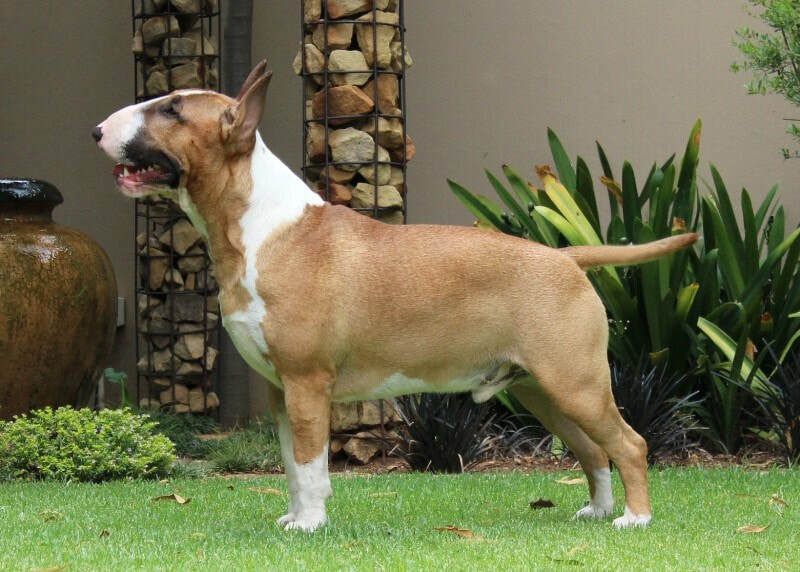 Bull terriers need a medium, suburban sized garden, though they will live in a smaller garden, with regular walks and trips outside the premises and should be allowed to live indoors with their families. A bull terrier is NOT for you if you work long hours during the week, or work away from home often. They do not fair well with Workaholics. They can become bored very easily, so if you are a couch potato of note and would rather be in front of the TV, then no, rather get yourself a cat. If you also are house proud and cannot tolerate shedding or hair woven into those expensive suede couches then a bull terrier is also not for you. Believe it or not, but that short coat sheds a lot! Are Bull Terriers Compatible With Other Dogs and Animals? Bull terriers are high prey drive breeds and will immediately be sparked off by a smaller animal that runs off suddenly and quickly. So socialization is key. Smaller toy dogs will not make good play mates. 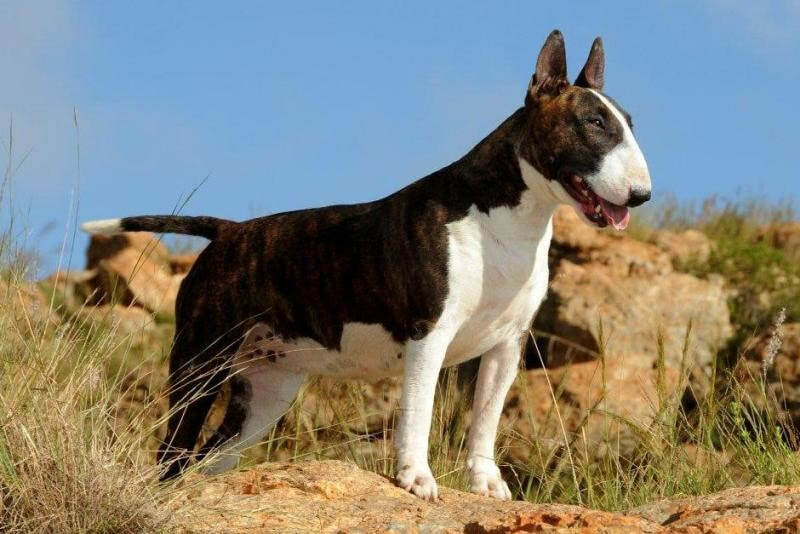 They are too small and the bull terrier will either give chase, like with the cat, or may end up hurting the small dog, due to the bullie’s rowdy personality. Bull terriers are definitely better with dogs more their own size and from a different, more relaxed group, like Labrador or golden retrievers, pointers, border collies or larger spaniels. ​It is best to avoid getting two dogs that have such high prey drives to kill, like the other “fighting breeds,” pit bulls, Staffordshire bull terriers and chows. Especially if they are both males. With LOTS of socialization it can work, but will require supervision as they both hit sexual maturity. Male and a female will get on with each other generally, but if you want a calmer environment with no potential outbursts of rage, having a bull terrier with another “fighting breed” is best avoided. Firstly, know the temperament of a bull terrier. Highly active, interested, playful and very attached to family, then incorporate this into a training routine. ​Obedience and socialization for young pups are a must, preferably between the ages of 8-16 weeks and then continue well into the first 9 months (early adolescence). 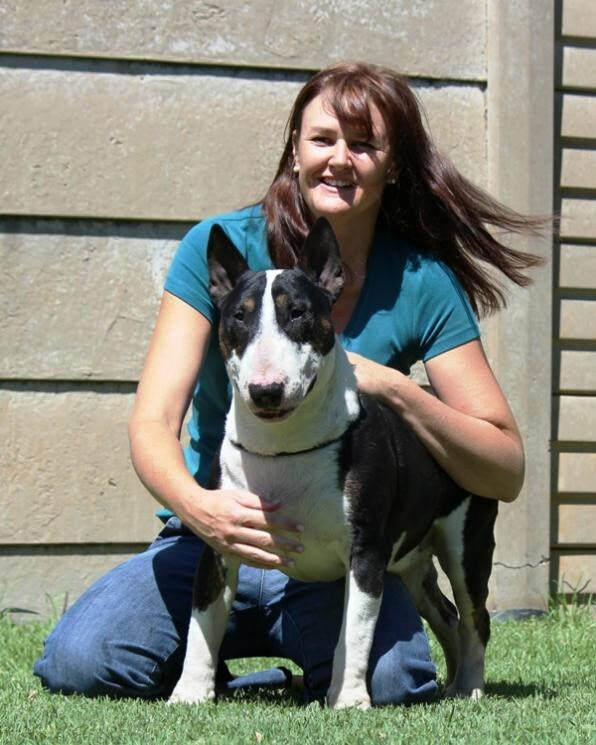 Socialization is a continued process throughout the bull terriers life. They respond well to positive reinforcement and are highly motivated by food and toys. They should be handled with patience and kindness. Punishment and provoking a bull terrier will just encourage a nasty, reactive streak which we want to avoid. Clicker training gets a good response out of the bullie, using a yummy food reward of viennas, cubes of cheese or chicken. They are easily distracted by movement, so train your bull terrier away from other pets or running children. 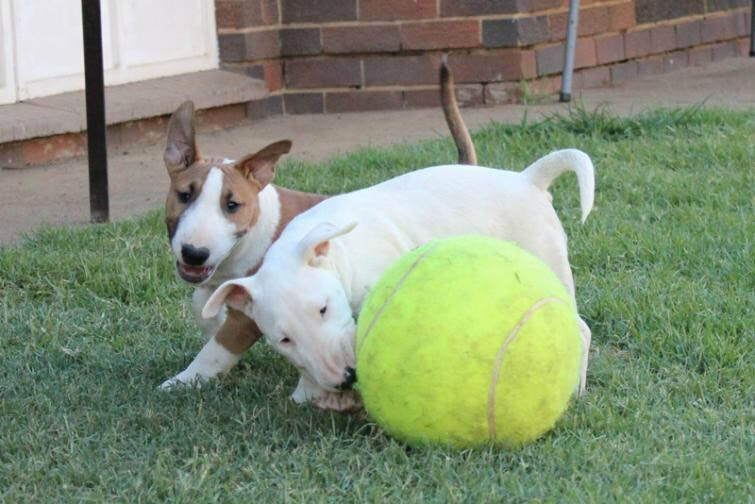 The bull terrier is quite rambunctious and must be taught not to jump up or nip and grab when playing. Many new items of clothing have been ruined by a nipping bull terrier! 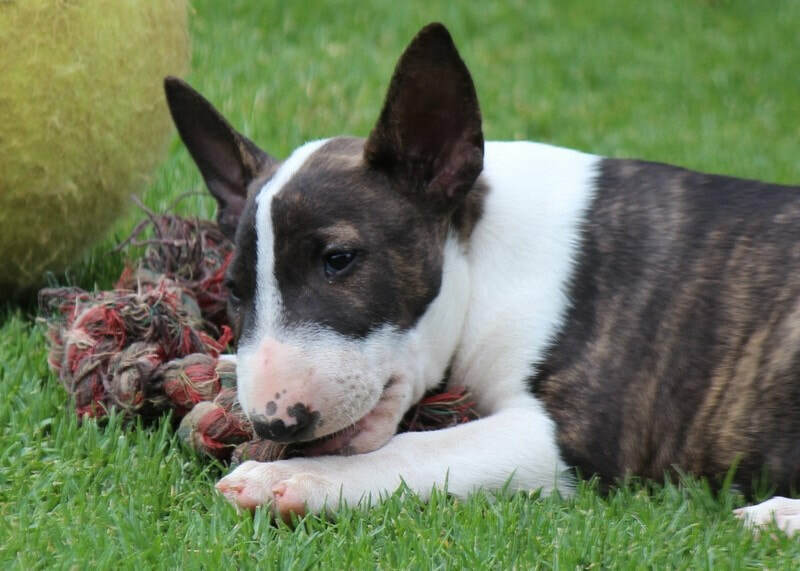 Bull terriers do have a strong urge to chew, so provide the right toys and avoid smaller, softer objects which can be swallowed and ingested. If you do not provide chew toys for them, then you will get home to a newly landscaped garden with BT designer furniture! They do require grooming about once a week to help loosen their coarse hair that sheds easily, using a soft bristle brush or a slicker brush. The hair is likely to fall out everywhere and weave itself into all fabrics and materials if the bull terrier is not regularly groomed. They can also be wiped down with a damp micro fibre cloth to add a bit of shine to their coats. They can become dirty and smelly quite quickly, so a regular bath of at least every 6 weeks is advised, with a hypoallergenic shampoo. They have sensitive skins and cannot handle harsh shampoos. Skin allergies- eczema, sunburn and acne (especially around the chin and nose) keep the mouth and chin area as clean as you to prevent acne break outs and keep them from lying in long grass to avoid eczema. Flea allergy dermatitis may look like eczema, but needs different treatment to that of eczema. Provide your bullie with a pet sunscreen on the belly, under the armpits, inside the tips of the ears and nose area to prevent sunburn and skin cancers. Heart disease and heart mummers are a concern. This is a typical bull terrier disease and recommended tests should be done to rule out these problems. Kidney disease (nephritis) is another concern for the breed. Sometimes a Bull terriers can suffer from OCD (Obsessive compulsive Disorder) or CCD in the dog world (Canine Compulsive Disorder) This can result in a common practice of “Tail chasing,” also known as “spinning.” A bull terrier can become so consumed in biting and nipping at its own tail, that it results in not only a bad compulsion, but also can cause lesions or open wounds on the tail. The bullie can do some bad damage to its own tail and sometimes as a result of how serious it can be, the tail may need to be amputated. This aimless behavior is believed to be linked to a neurological factor, brought on by anxiety or stress. But it is also believed to be a genetic disposition. Another known behaviour problem seen in many (I think this is actually quite rare in bullies) bull terriers is “SOA- Sudden onset aggression” or “Rage syndrome” seen in spaniels. It is thought to be a partial seizure disorder. It is will be displayed as “waking SOA,” where otherwise normal dogs will display a sudden burst of uncontrollable rage upon awakening. The behavior is not really in the dogs conscious control, so behavior modification and training may not control it. Bull terriers have some very quirky traits that make them,well, a little unique in the dog world. Trancing- Known as the “Bull terrier Ghost walk,” is a unique, common trait that has only been seen in bull terriers. Also believed to be somewhat neurological – “Trancing” is when the bull terrier seems to go into a “trance like state” when they walk under table cloths, hanging plants, curtains or bushes in the garden in EXTREME slo-mo, almost like a robot. It seems as if the hanging objects “tickled” the back and head of the Bull terrier, who seems to enjoy it so much, that their eyes gloss over and no amount of calling its name will bring him “back to earth.” There is no major concern for this particular activity and your bullie will come out of it, eventually. Hucklebutting- another weird bull terrier past time, is when your bull terrier may all of a sudden become VERY excited and will run around at warp speed, dodging objects and slamming into walls, zooming around the house and garden. Best to sit back and enjoy the show because if you get in the way-injury is likely! Do sterilize at 6 months of age or on your vet's advice. Don't get left with unwanted pups - breeding is a science and and art and should be left to the professionals. Do make sure your pup is 8 weeks of age when you bring it home. The period 5 - 8 weeks is critical in the social development of the puppy and pups taken too early are prone to fear and behaviour problems. Do take your puppy to Puppy School as soon as the 2nd set of vaccinations have been done. The period up to 16 weeks is a crucial one for pups and Puppy School can be compared to Nursery School for toddlers - it sets the foundation of future social behaviour. Do continue the socialization with other dogs (always make sure they have been vaccinated against Parvo and other diseases and are dog friendly, and also with people - of all sizes and ages. Do make your pup part of your family, this breed loves company. Don't leave them alone outside, this breed thrives on human companionship. Don't let them off lead unless you are in an area that is safe to do so. Don't leave them unsupervised with children and small pets. Don't get a Bull Terrier if you are a couch potato yourself - this breed needs exercise and stimulation, but you do get the odd couch potato when the get a bit older. ​Don't let you Bull Terrier lie and sun bathe without putting on sun screen. This breed is very prone to sun burn, especially the white skinned breeds. Don't get a Bull Terrier if you work long hours or are away from home a lot. 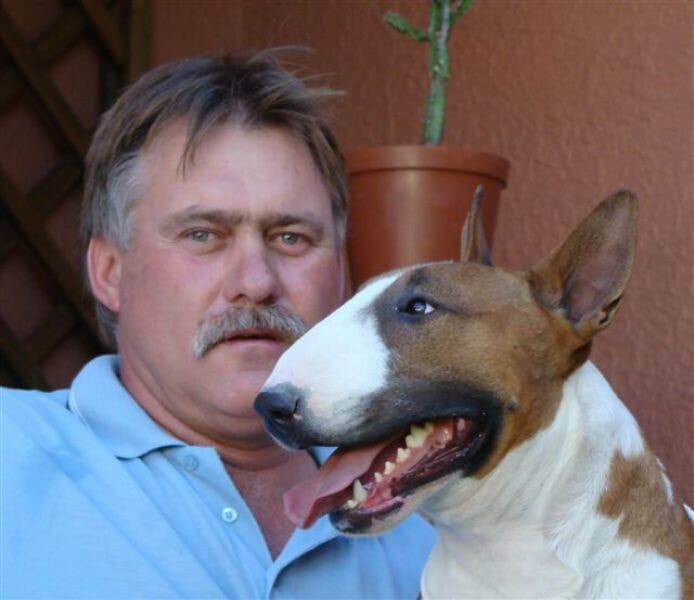 Some Pictures below of the Breeders Bennie and Tania van Niekerk, with their much loved dogs - this is the stock that your pup would come from.